You feel exhausted. One of the benefits of exercise is feeling invigorated at the end of the workout. If you’re constantly feeling tired and sore, it might be time to cut back or reduce the intensity of your current routine. You lack of motivation. You typically enjoy your daily runs or trips to the gym, but now exercising seems more like a chore. You’ve probably heard that exercise releases endorphins, or feel-good hormones, but over-training can negate these hormones and cause feelings of moodiness and depression. Time to relax and recuperate! You catch a cold or get sick often. 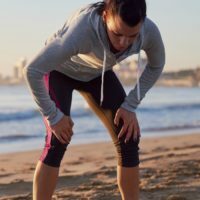 Over-exercising can be taxing on your immune system. When your immune system is stressed or compromised, it can take longer to fight a cold or recover from feeling sick. Your heart rate is high. Check your (resting) heart rate first thing in the morning. Athletes track their heart rate as a gauge of increased fitness—the lower the heart rate, the more aerobically fit you have become. But a high resting or waking heart rate is a sign that your body is in a state of stress which can develop from too much exercise. You become injured or have increased pain. Major or minor injuries start to occur due to overuse of particular muscles. After a workout, muscles need time to repair. Give yourself a little break and try a new class or new form of exercise. Switching up your routine gives muscles time to rebuild and cuts back on the rate of injury. You’re not making any progress. Instead of making gains in your performance, you are unable to perform as well as you previously could. If your routine feels much harder than usual, your muscles may need a break. You’re having sleeping problems. Over-training can release hormones, such as cortisol, that can have adverse effects on sleep patterns (1). Cortisol is released in times of stress (working out causes stress on the body), and when high levels of cortisol are circulating in the bloodstream for prolonged periods of time, you can experience insomnia, restless sleep, or sleep interrupted by frequent bathroom trips.